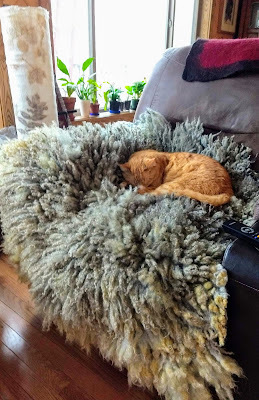 There was a discussion on the Shetlands list about how to make an inexpensive shelter for sheep out of cattle panels, T-posts, and a tarp. 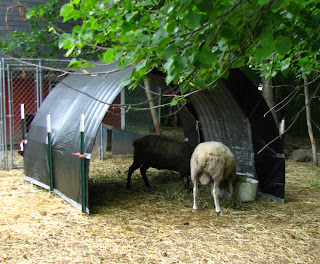 We redid our T-post shelters this summer so I thought I would post these photos of the ram shelter. As they say, a picture is worth a thousand words! This shelter is made with two cattle panels, you can use as many as you want. We've used this two panel size to house about 5-6 Shetland rams over the winter...it keeps them out of the wind and rain and snow and keeps their hay dry. A word of warning, if you have horned rams, be sure to watch for any poor souls who get their horns caught in the panels. They learn after a while to keep their heads clear, but getting stuck can be dangerous for them. Then we take a cattle panel and position it inside two T-posts, bow it down to fit inside the corresponding T-posts across from it. The tension holds it in place while we secure it to the T-posts before installing the next panel. We use twine to tie the panels to the T-posts. We tried plastic electrical strips in the past, but they can snap in cold temps. When all the panels are in place, we tie them together along the arch and then cover the whole thing with a heavy duty tarp. This year we decided to tie the panels farther up the T-posts for added resistance to sheep who may try to climb up the sides or rams who love the spring of the arches when they bash them. Hoop houses are wonderful! :-) I was just getting ready to put up a post about mine. I re-covered it with a new tarp today (the other lasted almost three years) and it's good to go for the next couple of years. Mine is built on a landscape timbers/wood square base, but I like your idea of the fence posts. The area I have the hoop house in is solid cement a few inches down, but I can see where the posts would make one more sturdy and less likely to lean. Do you think I could use one of those as a shelter for my Toyota Yaris? Instead of using T posts, if you set some taller lumber or wood poles, & re-inforced the sides by attaching plywood, (on either one of both sides), so the mesh would be under the plywood, you'd have the height & sturdiness you need. We're doing the same thing right now, between two 5'5" tall, heavy duty cattle run fences, 24' long, to build a run in horse shelter. There are so many great, easily adaptable ideas here! Thank you Becky for directing me to this post. These are GREAT! I am making 2 next weekend. So easy! We have a bunch of T-posts around and I think these will be ideal. I'm not sure if I can use for my goats due to their climbing tendencies, but maybe even the llamas and donkeys would like one! I had thought it was two cattle panels wired together along the short end to make the hoop, but it seems to be just one. I had no idea they would make a shelter tall enough. Ours are 16 feet long though, so I guess they would. I have to go see what sizes of tarps I can find. I'm also going to go to the fabric store and see what they have in the outdoor fabrics section on clearance - like stuff that people use for deck umbrellas and such. Would be waterproof and strong. Thanks again for this great idea! So I wrote a post on my blog about using hoop houses again this year for winter shelter. I liked this article so much that I decided to send folks here to see how they are made. i also stole one of your photos since yours look so much better than mine. Please forgive, if you want me to not use your photo I will. 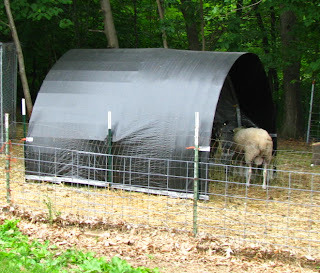 Love the shelter, and have been doing these for a few years for chickens, hogs, and turkeys. I do have a question, though, about the pics... Are you using a piece of wood along the bottom to secure the cattle panels to the T-posts? It is hard to see well, but that is what it looks like. No, there's not a piece of wood along the bottom, that lighter line along the bottom in the photo is just the silver side of the tarp. We just used the grommets to secure the tarp to the panels. The shelter in the photo lasted two years and it was the geese nibbling at it that finally made it look pretty shabby so we took it down. It held up well to wind and snow. We had several severe storms this past summer and the 3-panel shelter we made the same day as the one iin the photo is still standing, but the wind that took down a huge oak this summer also put a permanent kink in the cattle panels. Still, it's been a cheap way to provide shelter for the sheep. I love this idea, especially since I can't afford big buildings for sheep and I would love to have some within my lifetime! We get some awful winds here in southeastern IN, since we live on a hill...what about a windy winter? Will the sheep be okay, and how would I keep the wind off of them? The shelters are designed to keep the sheep out of the wind and rain. You need to place the shelter so that the prevailing winds hit the sides, not tunnel through the shelter. If it's especially windy in your area you should probably reinforce the sides or build a more substantial shelter. I took an old blanket and placed over the panel but under the tarp to aid in where and tear of the tarp. Also, at the ends of the building, capped the panels with swimming noodles and/ or foam pipe insulation, then folded the tarp in and bungeed and zip tied (the black ones last longer than the white ones).